I assume that is a corpse mountain of contributing authors. No cat people, no guns, no explosions … Baen really toned it down for this one. Is it possible that GSS will now be honoured with a second visit from the great man himself? Is that….the fabled Chia Pet font? I’m thinking today’s date may be relevant to today’s post…? @David Cowie: You can tell this is a classy book, see? They restrained themselves and left off the cat people, guns, and explosions. It’s the pinnacle of classiness for this important work. The tag cloud is a thing of glory. Except the publisher is NOT unknown! This is currently rated #1, ahead of our old pal “I Sing”, and those creepy French covers. @GSS ex-noob – Thanks for catching the publisher. Yes it took awhile to add all the author tags. This book must be over a thousand pages long! He stood upon a mound of corpses; men he had cut down not with the blade of his axe, but with the sharper blade of his pen. Needs more tags – perhaps ” girl has super glue on hands ” ? Shouldn’t it be ‘skulls a-croppin’? Is that pile of corpses representative of the authors whose stories are in the book? OK, now that you’ve had your little joke I strongly suggest you immediately take down this post. Otherwise, I have no choice but to have my attorneys get a court order first thing Monday morning. In other news…I saw a turtle! Does need more Ting. There could be Ting off the mighty axe. @THX: may I suggest…blind obedience? @gssxn No wonder Mr. Ellison is so miffed. He gets roasted on GSS and doesn’t even get any ting. Q. What is that pile of corpses resting on? A. It’s just corpses all the way down! @20: He thought it was pretty funny until he noticed the publisher. That was the final straw. I’m wondering where this came from and why it’s a fake, when nearly all the covers I’ve checked out are real ones which I’ve seen in years (Hell, decades) gone by. I wonder who the artist is, and if you or somebody took an existing s&s cover and pasted Harlan’s face on it. Since I’m an editor at Baen Books and also a long-suffering contributor to The Last Dangerous Visions (since I sold HE that story in 1969), you may discount this opinion, but much of the intended wit is strained (maybe you should use a wider mesh). 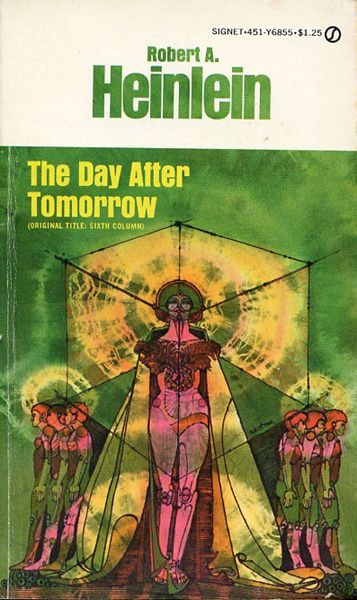 I will note that instead of making sport (very strained) of the Baen edition of Heinlein’s Sixth Column, which is connected to the book’s contents, at least, you should go after the sorta abstract cover that Signet (NAL) pubbed in the 1970’s, when they were still using their retitling of “The Day After Tomorrow” on it. Oh, and yes, I am aware that Mr. Ellison is no longer with us. Hello Hank and welcome to the site! Perhaps the answer to your first question can be found by checking the date of the TLDV post. BTW, so you don’t confuse our intentions, please read the “About” link on the top menu. So many misunderstand what we call “terrible”. We love all our covers. @Tag Wizard – Who woulda thunk that an eight-year-old post on the Sixth Column would bring about a backlash from the science fiction writers of america? @B’mancer: Not all of them. Most of them have been quite kind when they pop in here. Even the late great Harlan himself was quite civil! Hank’s simply a) missed the date and the gob-smacking obviousness of this cover b) probably a bit hurt that we make fun of his employer’s books a lot. Also he’s missed the fact that we can only comment upon books found out in the wild, so if he wants us to make fun of the Signet cover, he needs to send it in and we’ll be happy to. I do wish people would read the “About” link. If this is the one he’s referring to, we’ll make a LOT of fun of it. I hope he’ll join in. I must agree with Hank Davis. It was done for fun, but we certainly don’t want his lovely wife Susan to know its still there, when her late husband did ask you to take it down. So, get to it mate. @Mark Owens – Unlike some, Harlan was smart enough not to engage with an April 1st blog post. The takedown request is as fake as the cover. 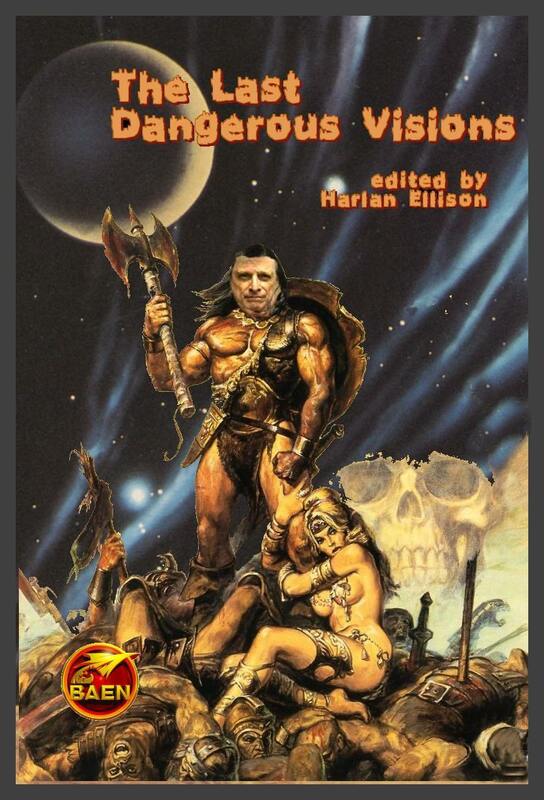 I’ve started reading the first Dangerous Visions tome as a kind of tribute (it had been on my shelf for a year or so, it was about time I dived in). Digested 3 or 4 1960s envelope-pushing tales, all very well, but now I’ve reached Philip José Farmer’s James Joyce pastiche and have no idea what I’m reading. There’s stream of consciousness and there’s random. Harlan says it’s the best story in the book! @THX – If I remember correctly, that story is a 50-page joke so Farmer can use the pun “Winnegan’s Fake!” as the punch line? But it won the novella Hugo, so tough it out. @Biblio: That’s the one! Oddly, I read Harlan claim puns were “the lowest form of wit” and this story is packed with them.